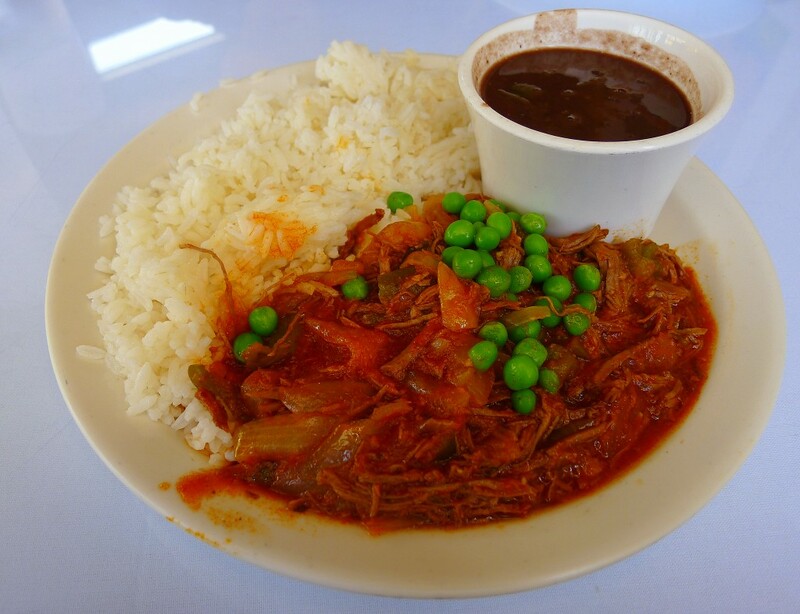 If all of the food at Andrés Restaurant in Linda Vista were as good as the ropa vieja (“old clothes”) dish, the restaurant would be near the top of my list of the top 10 ethnic places in town. As it is, that dish alone—a deceptively simple stew of shredded flank steak in sauce—is enough to make the place one not to miss. The caramelization from the sear, the depth of flavor—both from the braise and from the sofrito base—yield a plate of food that’s exciting, soulful and speaks deeply of where it’s from. It’s not a high-end restaurant dish. It’s not perfect in every way. It’s just perfect in the ways that really matter. But, sadly, all of the food at Andrés (1235 Morena Blvd.) doesn’t quite rise to that level. My original reason for going was a serious jonesin’ for a Cubano sandwich, Cuba’s unique take on the traditional ham-and-cheese, featuring ham, roasted pork, Swiss cheese, pickles and mustard on pressed Cuban bread. The key to a great Cubano—indeed, the key to any great sandwich—is the balance of the various elements. But somehow with such prosaic ingredients—and the ham here is neither prosciutto, jamon iberico nor Southern country ham but, rather, just an ordinary supermarket-grade product—there’s really nothing there to make up for a lack of perfect balance. Andrés’ version, unfortunately, required too much searching for the ham and pickles in the forest of pork and bread. Andrés’ cheese empanada was even worse. No doubt the cheese inside the dumplings was not Velveeta, but the fact that I could wonder (even for a moment), was damning in and of itself. These empanadas were fried dough encasing—perhaps entombing—indifferent cheese. I don’t have time for that and don’t know anyone who does. If so, they’re probably not reading this column. But the empanadas de pollo were another story altogether. I say an enthusiastic “¡Sí!” to a brilliantly crispy, deep-fried exterior that covers a magnificently moist and savory interior. Dipping it in an excellent mojo sauce, featuring olive oil, citrus and quantities of garlic that even Emeril Lagasse wouldn’t have joked about, makes this an absolutely perfect pairing. Andrés uses the same mojo on the pierna de puerco asada, taking a simple plate and amping it up a notch or three. The result is a slowly roasted, wonderfully moist product with layers of flavor: a caramelized exterior and succulent interior set off by that pungent sauce. The flavor profile of the mountain of rice and little cup of black beans works, though the proportions are out of whack. And that brings it back to that ropa vieja. There may be nothing elegant about the look of the dish, but the wine, the tomato and the deeply braised flavors all raise the question: So what? There is elegance in the flavor and balance to the dish, and that’s reason enough to go back to the restaurant and enjoy it again.